Göran Edman will be familiar to some of you as the man who provided vocals for Yngwie Malmsteen between 1990 and 1992, appearing on his ‘Eclipse’ and ‘Fire and Ice’ albums. More recently, he’s been the frontman with melodic rock outfits Street Talk, Brazen Abbott and Escape Music signings Vindictiv. He’s also stepped in as vocalist on various other projects, including a couple of releases masterminded by Flower Kings bassist Jonas Reingold. In short, in the world of European rock music, Göran has always been an “in demand” vocalist. This debut release by Stratosphere finds him fronting yet another symphonic melodic rock band; this one the brainchild of Scandinavian keyboard virtuoso Jeppe Lund. In addition to Edman and Lund, Stratosphere features Anders Borre Mathiesen on bass, Jim McCarty on drums and Jonas Larson on guitar. While Stratosphere is credited as being Lund’s band, it’s certainly Larson who is the real star. His guitar work throughout most of the disc is top notch, provided, that is, you like your playing with a Euro neo-classical bent. It’s somewhat unsurprising that Stratosphere’s music takes the bombastic Scandi route, but the end results are, for the most part, about as good as can be for this style of rock. ‘Russian Summer’ opens with a crunchy mid-paced riff which is unmistakably European. Göran Edman takes the opportunity to make his presence felt as he hits some great notes. Jonas Larson’s solo features plenty of sweeping notes; there are plenty of great features here if this kind of hard rock is your bag – the only minor flaw being the chorus: it sounds like it should have a major hook, but try as it may, it’s not especially memorable despite carrying a decent core melody. ‘The Battle Within’ takes things up a gear with a busy guitar riff which would be typical of Yngwie Malmsteen at his best. The vocals are fairly grandiose with plenty of ‘whoah’s as backing. Honestly, given the song title, I’m sure you know what you’re getting here! …And if that’s what you want, it does not disappoint – particularly during the pre-solo bridge, as Larson hits upon a Celtic motif, backed by Lund adding pompy string sounds as backup. I’d hoped ‘Princess of the Night’ would be a cover of the popular Saxon number from 1980, delivered with a suitable amount of energy. 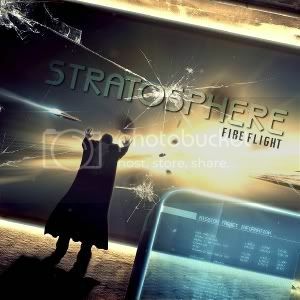 Instead, it presents Stratosphere’s chance to slow things down with a big power ballad. Fairly sizable backing vocals are on hand in the relevant places and Lund’s blankets of keyboards work well throughout, but it’s Edman’s lead vocal which provides this number’s best feature. He belts out his lines with effortless grace and although the pomp element to the music attempts to drown him out in a couple of places, he holds his own. Larson’s solo is a little too busy for the space it occupies, but it doesn’t spoil what’s otherwise an album standout. With Lund’s keyboards providing one of the key musical features (thus taking the focus away from Larson’s guitar a little for a change), ‘Streets of Moscow’ offers plenty of melody. On this mid-paced rocker, Edman sounds at ease, as if he’s sung the song a thousand times. Of course, it sounds rather like something which would have graced a Malmsteen album way back when, but given Edman’s presence and Larson’s guitar style, that’s more than to be expected. I’d certainly rather listen to it than the instrumental which follows… ‘Rendezvous’ is a lightning speed neo-classical workout where Larson and Lund take turns to show off their musical prowess to levels of self-indulgence. I appreciate these guys can play (and very well at that), but once you’ve heard the opening riff, it doesn’t deviate too much from there and after four minutes, it’s quite draining. ‘VIP’ opens with an wonderful intro full of sweeping guitar lines capturing Jonas Larson on top form. After such a promising start, it’s downhill from there as the band hammer forward at full speed with predictable Yngwie Malmsteen-esque bombast. This alone wouldn’t make it too bad, particularly given the effective backing vocal arrangement, but man, some of the lyrics are appalling. Featuring lines such as “your cold eyes are bigger than your belly boy / Sobriety is a virtue, god knows / Gluttony stepping on his toes / Stand in line, not the cup of tea for a VIP”, it doesn’t bode too well. It reads badly, but as Edman works his way through them at full volume it sounds pretty ropey too. A fairly energetic guitar solo which leans towards the neo-classical works quite well, but not enough to save ‘VIP’ being a skipper. For the neo-classical fans among you, the album closes on a high note. Beginning with a huge keyboard intro which would be worthy of Don Airey, the title track is a no-nonsense instrumental number which features fantastic guitar work throughout. Granted, Larson may not have the finesse of Ritchie Blackmore, but as far as these kind of neo-classical chops are concerned, he’s got more than enough clout to match Malmsteen and many others at the top of their game. While it has it’s busy moments, it’s far classier and more restrained than ‘Rendezvous’. ‘Fire Flight’ is certainly an accomplished debut. While there are moments where some of song writing is a little hit and miss, musically, Stratosphere hit their mark with a fair amount of consistency. As such, fans of Scandinavian rock music (and fans of Göran Edman’s vocals in particular) should find this album enjoyable. This entry was posted in hard rock by Real Gone. Bookmark the permalink.